There is no such thing as a free lunch, but there are free baseball drills. And I want to point out that all the helpful baseball drills on this website are free. 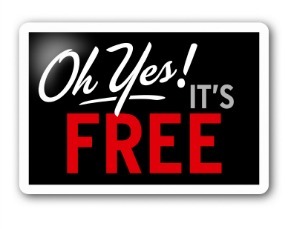 In fact, with the amount of websites offering free youth baseball drills, why would you ever pay for any? One more point I would like to make is the best baseball drills are the ones that keep the players interested. And those are the fun ones. Free baseball drills can be helpful and fun at the same time. Try to add competition to a drill whenever possible. The players love competition and it helps hold their attention. If you have looked at some of the other free baseball drills on this site, then you probably heard that message before. I’m sorry for the duplication, but it is worth saying over and over. Make your practices as enjoyable as possible. Now I will move on to free baseball practice drills. Below I’m going to describe one of the good free baseball practice drills. This drill teaches outfielders how to get back on a baseball hit over their head. So many times we see a hitter get a big hit and it drives in the winning run. And that hit could have been caught by the outfielder, but he got a bad jump on the ball. This “drop step” drill is going to teach outfielders to not back pedal to fly balls, but to turn and run to the baseball. Even fast outfielders who’s first step is in on a fly ball hit over their head are in trouble. Practicing the drop step drill should help form a habit of reading the fly ball before moving. Hitting fly balls to the outfield from home plate is a tough task. To help with this drill, move yourself to the infield edge of left field. You are going to hit or throw fly balls to your outfielders. Some sporting goods stores sell rackets that are good for hitting pop ups to fielders. Anyway, whatever method works best for you will be ok.
You need to be deep in the hole at shortstop. The outfielder is facing you about 10 or 15 feet away. On your command of pointing the baseball to the left or right, the fielder will start running back in that direction. The fielder should take one step backwards, turn his body and run. He should continue to watch the baseball over his shoulder. After the fielder has taken a few steps, then move the ball to the other side. 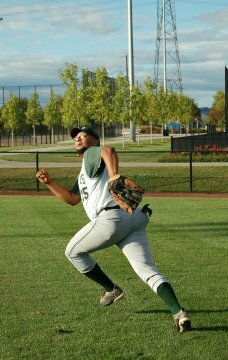 The fielder should also turn his hips and run the other direction. This represents the wind moving the fly ball around. If you like you can turn him one more time. Then let the baseball fly over the shoulder he is watching from. After each outfielder has a few tries, add a new twist to this drill. Bring a second baseman and a runner onto the field. Now, after making the catch, the runner will tag up at first and try to advance to second. The outfielder makes the throw to second, and you make the call. Runners and outfielders love this drill. Once you have done this drill many times from the infield area, you will want to have someone hit fly balls from home plate. Try to watch and see if the outfielders are using the drop step method. We have all seen major league outfielders go back and make great catches. And everyone says what a great catch they just made. But without a good jump on the ball, the outfielder would not have been in a position to make the good catch. I guess you could say an outfielder’s feet have as much or more to do with making a catch than the outfielder’s glove. Coach, work hard with your outfielders and you will start seeing those big hits turn into long outs.